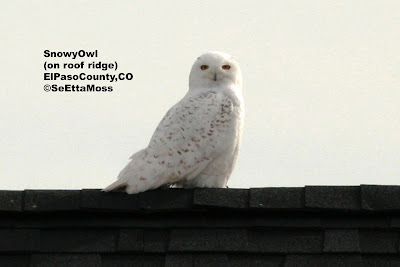 There was a brief discussion on our Colorado birding listserve this week in which several of us expressed our concerns about the impacts of birders and photographers on the Snowy Owl. Sadly some folks have no tolerance for views that are different than their own and one birder made sarcastic derisive remarks about those who have expressed concerns. Over the years I have seen similar discussions and not uncommonly similar attempts to bully those with concerns into silence. Some discussions with a professional nature photographer from California caused me to remember another professional nature photographer whose photography I admire and who is outspoken about the of photographing Snowy Owls. With his permission, following are his principles-I think they are great. These are video clips of the Snowy Owl that I took using the technique of 'video-scoping'--holding my point and shoot camera against the eyepiece of my spotting scope, thus enlarging the view. The top video clip shows the owl turning it's head to look around while the wind blows it's feathers. These are some of the digiscoped pics I took of the Snowy Owl last Saturday. Though it flew twice while I was there, it dropped down behind the houses so those of us watching only got brief glimpses so all my photos were of the owl on the ridge of one of the homes it used for perches. All my digiscoped pics were taken at about 200 feet from the owl. 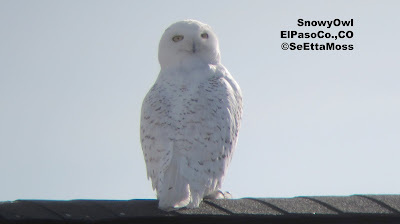 I took these photos of the birders and photographers watching the Snowy Owl in eastern El Paso County, Colo last Saturday. After several discussions on the Colo birding listserve about the etiquette and ethics of watching and photographing the Snowy Owl, I took these photos of the birders and photographers who were watching the owl last Saturday when I was there (by the way, I don't know any of them but I think the pics are sufficiently distant). I took these pics with my point and shoot. 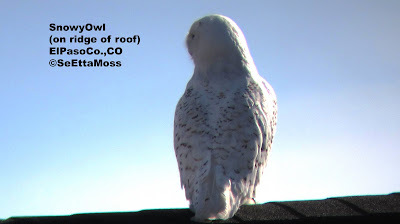 When I woke up this morning I realized that posting the photo taken with my digital camera lens equivalent of 640 mm does not really provide most people with an idea of what the Snowy Owl looks like without the benefit of super telephoto lens combos or spotting scopes. You see that 640 mm is more than 12 times magnification. So here is a pic I took with my point and shoot camera at close to 'normal' view (approximately 50mm). In fact, this is a totally unedited pic without not only the cropping that most of us do to enlarge the view but without the other tweaks like improving the lighting.